The first shall be last, and the last shall be first. So sayeth Stephen Colbert, who announced during his panel at the Television Critics Association Press Tour that Kendrick Lamar, his final musical guest on The Colbert Report, will be his first musical guest when he takes over as host of CBS’ The Late Show. Lamar appeared on Colbert’s Comedy Central show back in December to perform an untitled song flanked by bassist Stephen “Thundercat” Bruner and singer Bilal. 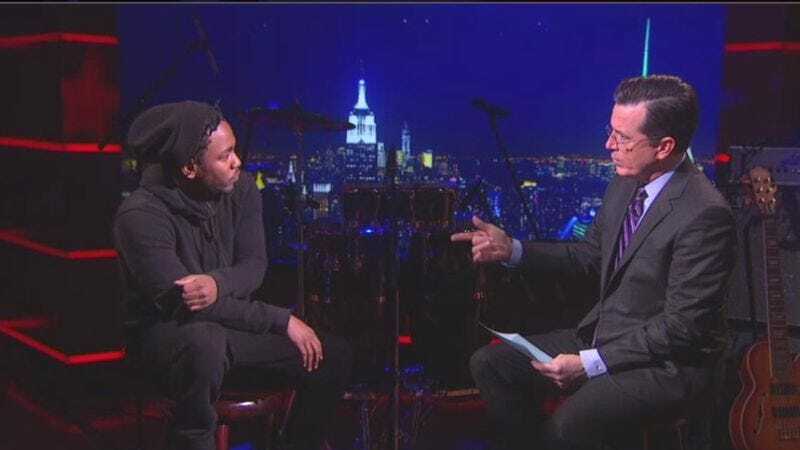 The song wound up being a Colbert Report exclusive, as it didn’t show up on Lamar’s latest album, To Pimp A Butterfly, and Lamar later announced he wouldn’t be releasing a studio version. Now Lamar will get to play before one of the largest television audiences of the fall. You scratch Colbert’s back, he scratches yours. The Late Show With Stephen Colbert debuts on September 8th.